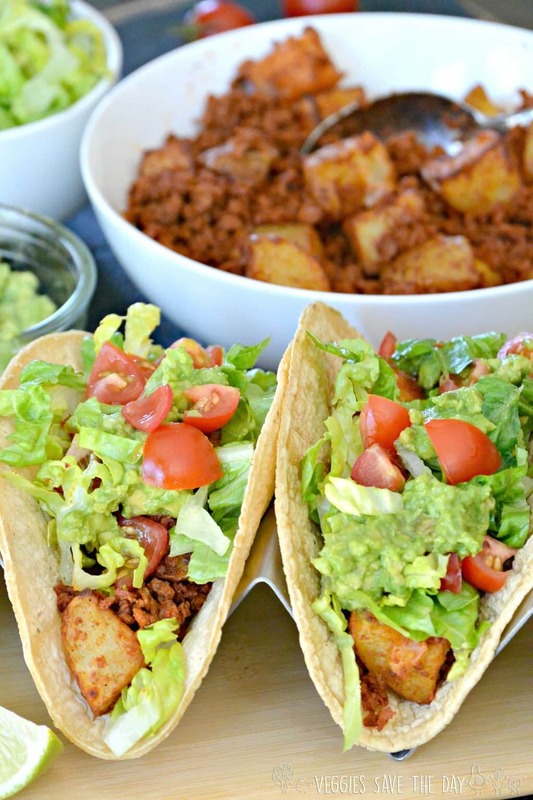 Soyrizo Potato Tacos (made with soy chorizo) are vegan and gluten-free. They are easy and delicious to make for Meatless Monday, Taco Tuesday, or any day of the week! Do you ever put roasted potatoes in your tacos? I’ve been doing it for years in favorites like Vegan Potato Tacos with Massaged Kale. However, this recipe takes the potatoes and adds another layer of flavor and texture by adding soy chorizo, otherwise known as soyrizo. My friends and family love these tacos. In fact, when I’ve served them to omnivores, they couldn’t believe they weren’t eating meat! 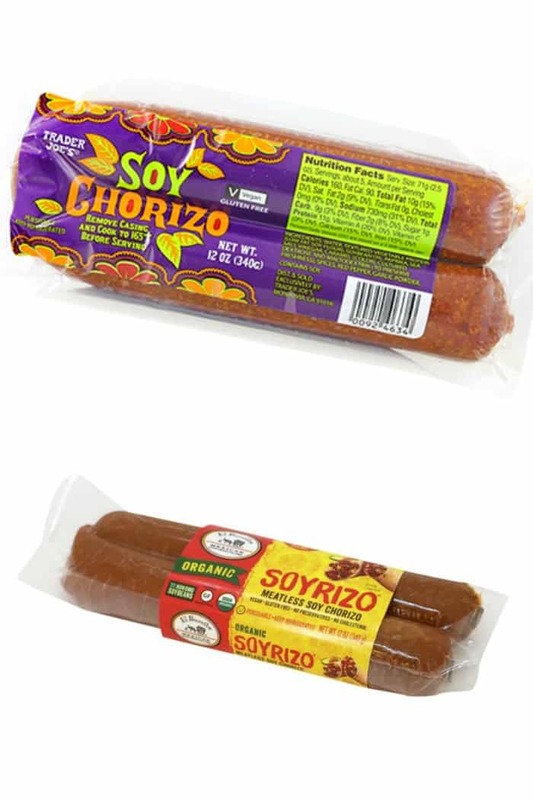 While I’ve never tried traditional chorizo, many people tell me they enjoy soy chorizo better. Soyrizo is easy to find in most supermarkets. I’ve purchased it everywhere from Trader Joe’s to Albertsons (Safeway) to Whole Foods. It’s usually sold in 12 ounce packages. All you need to do is remove it from the plastic wrap and heat it in a pan. One of the most popular ones I see is El Burrito Soyrizo. It’s affordable and can easily serve four to six people. And the Trader Joe’s version is even cheaper! It has a similar taste, but it’s a lot less greasy. Of course, soyrizo isn’t what I would consider a low-fat food on its own, but we’re combining it with potatoes and only using a relatively small amount for each taco. It provides an incredible flavor from spices such as garlic, chilies, and paprika. Making Soyrizo Potato Tacos is easy. It’s not necessary to use any oil when you saute the soyrizo. I find it helpful to use a non-stick pan, but you don’t need to if you prefer to avoid them. For the potatoes, you can either roast them in the oven, or do what I did and prepare them in an Air Fryer. I love using the air fryer, especially in the summer, because then the house doesn’t get too hot from using the oven. In fact, ever since I got an air fryer, I rarely use the oven. I highly recommend them! As far as toppings go, the sky is the limit. 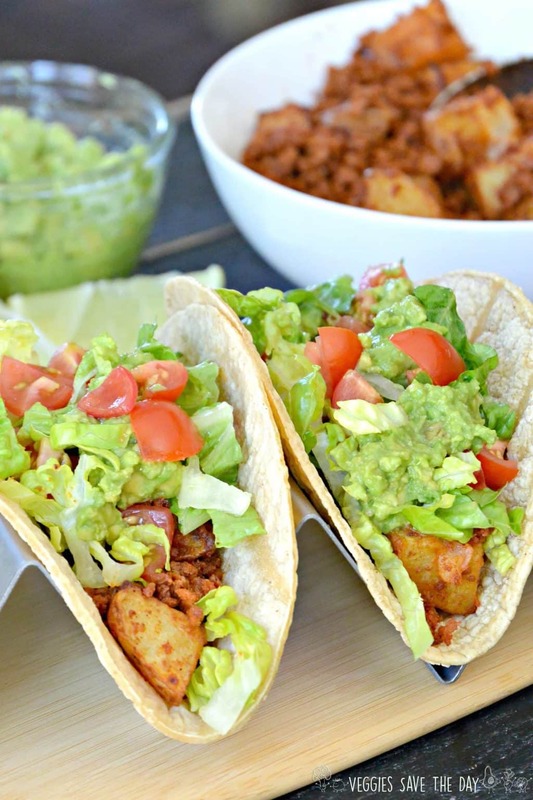 I really love topping these Soyrizo Potato Tacos with guacamole. The cool avocado balances out the spicy filling. I also add tomatoes and lettuce. Other options include diced onions, chopped black olives, and shredded cabbage. And, of course, hot sauce, if you like your tacos extra spicy! In addition, the potato-soyrizo filling is delicious in a taco salad. I love using the leftovers this way. If there are any, that is. Now let’s make Soyrizo Potato Tacos! 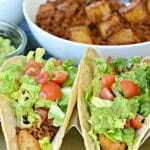 Roasted potatoes and soyrizo (soy chorizo) are combined to make a delicious filling for tacos (or taco salad). Top them with your favorite ingredients, such as lettuce, tomatoes, and guacamole. Combine the cut potatoes in a large bowl with olive oil, cumin, chili powder, oregano, and salt. Using your hands, toss to coat. Oven method: Preheat oven to 425 F. Arrange the potatoes in a single layer on a baking sheet lined with parchment paper. Bake 25-30 minutes, until potatoes are tender and slightly browned, flipping them after about 15 minutes. Air Fryer method: Air fry the potatoes for 15 to 20 minutes at 390 degrees (or according to the manufacturer's instructions). Shake to toss after 10 minutes. While the potatoes are cooking, saute the soyrizo in a non-stick skillet over medium heat, stirring often, until heated through. Add the potatoes to the pan with the soyrizo. Toss well to coat. 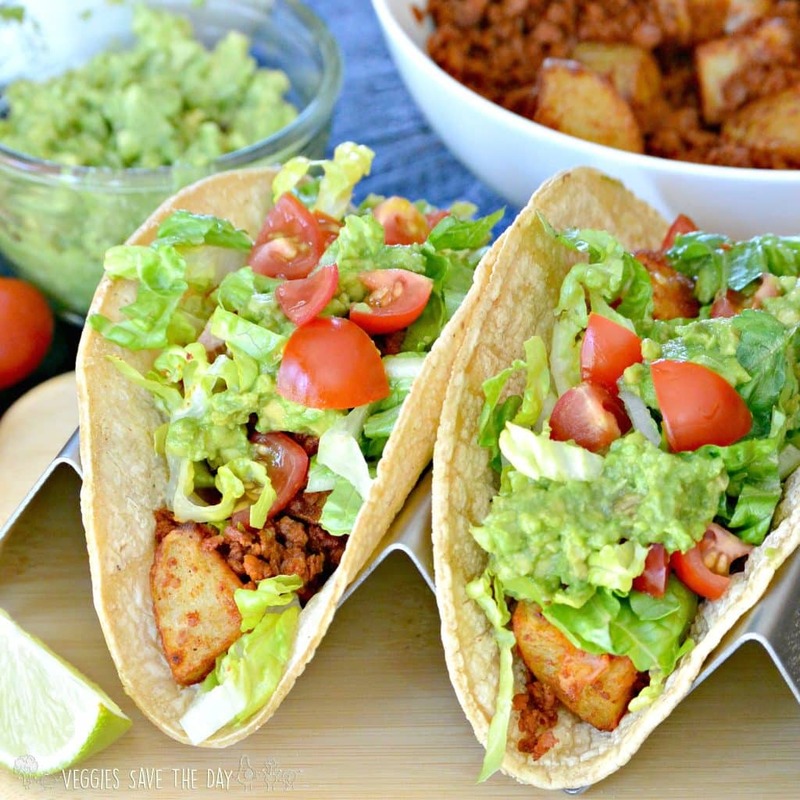 To make each taco, add some of the soyrizo-potato filling to the center of each tortilla. Add your favorite toppings and serve immediately. To warm the tortillas, I recommend heating them in a skillet for about a minute on each side over medium heat. As I heat each one, I stack them in an insulated fabric tortilla warmer to keep them ready to go for up to an hour! The potatoes can be cooked in either an oven or an air fryer. Ooh I love potato in a taco. I need to try it with the spicy soyrizo in this recipe for sure! What a great idea, Amy! I love potatoes in tacos so much. They are an under-sung taco topping. Thanks Cadry! I agree! They seem to be getting more popular in restaurants, but they are still far from mainstream. Not only does this sound amazing but I just LOVE the colors and presentation! 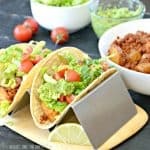 I love soyrizo and these tacos look incredible. Yum! I love it, too! Thank you, Sarah! Thank you, Marlena! I used to not like spicy food as much either. I love all the flavors! Plus, how could you go wrong when potatoes are involved? Thanks Rebecca! I completely agree! Potato tacos are one of my favorites. I love the addition of the vegan chorizo, so nice and spicy! This looks like some spicy deliciousness! I’ve only had potatoes in breakfast tacos, but I love the idea of adding them to dinner tacos too! Yum! Thanks Jenn! It’s pretty traditional in Mexico, but you don’t see potatoes in tacos a lot here. We love it! Potatoes + Soyrizo = the BEST combo! I’m trying your recipe ASAP!!! Thanks Sarah! We love it! I made these for dinner last night, (and am eating them for lunch right now) they are delicious!!! My 15 year old son is super picky and he gobbled up 4 tacos! I am new at being vegan and this recipe really hit the spot! Thank you Amy! I printed several more of your recipes and can’t wait to try them! Making the Eggplant Bolognese this weekend! Thank you so much for this recipe! My family is not vegan (or even fully vegetarian) but we are working steadily in that direction. We are down from eating meat 6 nights per week to just one, and with every new recipe I find that passes the “second helping” test we get a little bit closer. This recipe was a unanimous hit tonight and will definitely be staying in the script. That’s wonderful to hear, Don! And good for you for reducing your family’s meat consumption. This recipe is absolutely amazing! I cannot stop raving about it my husband doesn’t even like chorizo, and I’m eh on it, but we used the Trader Joe’s soyrizo and it was AMAZING. the potatoes are the perfect addition too. Thank you for this delicious recipe! Will be a staple in our house now. Thank you, Cara! The soyrizo from Trader Joe’s is my favorite. I’m so happy you both enjoyed the tacos!